As the team here at UC Funds move into the New Year, we like to reflect on the year that was and make in-house predictions on where we think Boston’s commercial real estate is heading. This article for the Boston Globe written by Tim Logan has been circulating around the office and we think it is the best overview of commercial real estate in the greater Boston area for 2015. It was a good year for people selling big-time real estate in Boston, though that may eventually mean higher rents for the people who live and run businesses here. Several transactions in 2015 marked local sales records for buildings and land. The biggest was Oxford Properties’ purchase of the office buildings at 500 Boylston and 222 Berkeley streets in the Back Bay for a combined $1.29 billion, or just over $1,000 per square foot for the two-building complex. Several other office buildings in Boston and Cambridge sold at or above the $600 to $700-per-foot benchmark that typically has defined the ceiling of Boston’s office market. Hotel deals have set records, too. “Buyers are as aggressive as they’ve ever been,” said Chris Skeffington, senior vice president for capital markets at Transwestern RBJ. “They’ve blown through the peak pricing of 2006 and 2007.” All told, according to Transwestern data, 71 sales of office buildings, apartment buildings, and hotels for $10 million or more closed this year in Boston and Cambridge, ahead of the waning days of December, for a total of $6.3 billion. That doesn’t count deals that are agreed to but not yet closed, such as the sales of the new Converse headquarters on Lovejoy Wharf by a German investment fund for a reported $150 million. Nor does it count just land deals, such as the $359 million purchase of 12 acres of Seaport Square in October by WS Development, which smashed a record price for land that had been set just in August, when DivcoWest paid $291 million for 42 acres at NorthPoint in east Cambridge. But the same trends that are drawing investors to downtown business districts are drawing many companies there, too: Access to talented young workers who want to be in the city or near transit. That does give landlords leverage, Smith said. That leverage could fade if the economy slows and job growth stalls, though economists tracked by JLL predict that the unemployment rate here will stay below 5 percent for the next few years. And many of the city’s new big landlords appear poised to ride out any bumps in the economy. Some of the biggest buyers in Boston in the last two years have been global investors with long-term plans. Oxford has built a big portfolio here on behalf of the Ontario Municipal Employees Retirement System. A Norwegian sovereign wealth fund owns several prominent downtown buildings. Chinese institutional investors are taking a growing stake in the Seaport District. Those operations are aiming to buy and hold — unlike some of the bargain hunters who bought buildings cheap during the downturn and have sold as the market revived — and will accept a lower return in exchange for long-term stability. Those longer time horizons also mean there probably will be fewer big-ticket deals in the next two years than there have been in the last two. So many trophy buildings have sold that there just aren’t that many left out there for the taking. 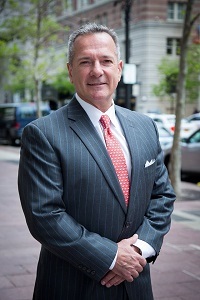 Daniel Palmier is the President and CEO of UC Funds and he has over 25 years’ experience in the real estate and financing industry. To read more about real estate, finance and Boston related topics go here. You can read more about UC Funds here.